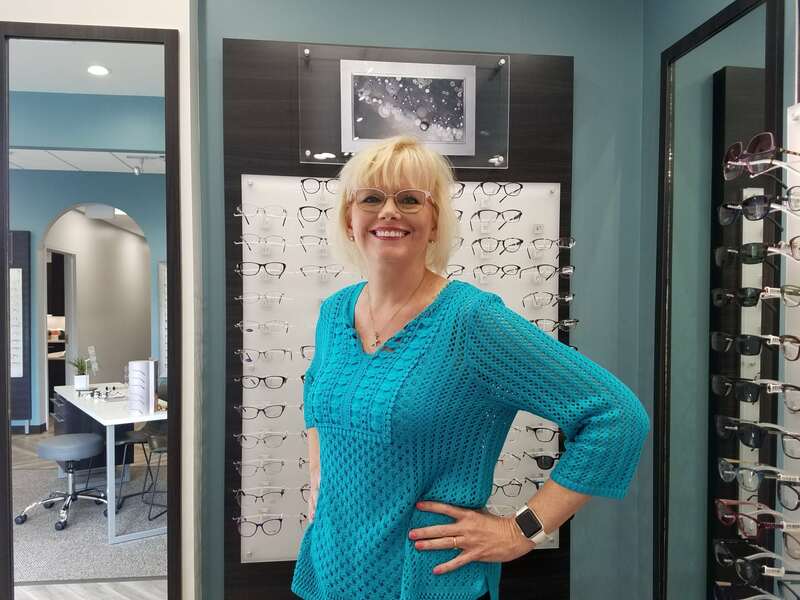 Dr. Margo Hagen is an Optometric Physician whose practice has been in Sapulpa for almost 19 years. In December, she will celebrate one year in her gorgeous new digs at 1029 E. Taft, after moving from a nearby shopping center. Eye To Eye’s new location sits across the street and around the corner from their old location. Now, the huge building sits on a site with plenty of parking and room to grow. Dr. Hagen proudly admits she made every design or decorating decision. Her unique rock wall had to be redone to get it right. Dr. Hagen is a native of Aruba. Aruba is a tropical island off the coast of Venezuela that is part of The Netherlands. Her mother and father were both Dutch, and her father was part of the Dutch government in Aruba. Aruba’s main trade is tourism. When her father retired at 50, he was required to take his family of 7 back to Holland. As a girl, the doctor said she didn’t like it at first because it was cold and rainy, but she grew to like it. It also was just the beginning of changes in schooling for her. She wanted to be independent and chose a profession that would give her that peace and security. Once she read a Labor Department brochure about Optometry, which involved going to school I day a week, and self-study the rest of the time. It seemed practical, and she could go right into an internship. After 5 years, she was an optician and then straight on to 7 years’ study for optometrist. All that time, she was the only woman in any of those classes. She was working at University Hospital in Nijmegen (Naymee-hun) when she gave an eye exam to a United State Air Force serviceman, Richard Hagen. After a while he asked her out, and then he was transferred to Utah. She vacationed there and then returned to Holland to finish her finals after 7 years of school. He proposed over the phone and she moved to Utah. The inside lobby and display walls of the new Eye To Eye location. Dr. Hagen says she made each design decision herself. More schooling followed, since Utah didn’t accept a Dutch degree. She worked under an ophthalmologist as a cornea specialist. She tried to get the Utah Ophthalmology Board to give her an exam. “Not a lot of cooperation,” remarked the doctor. When her husband’s Air Force career took her, she went to Wichita, Kansas, and worked for Dr. Claron Alldredge, who specialized in contact lens fitting for diseased eyes. Then she worked for Grene Cornea when it was a small business. Now it is large with a worldwide reputation. More schooling. She decided to get an American Optometry degree. Dr. Hagen was working on her bachelor’s at the same time her husband was working on his. Richard retired from the Air Force and Dr. Hagen attended NSU at Tahlequah for optometry. The Hagens moved to Tahlequah, so she went 4 years for her bachelor’s and then 4 more years for a doctorate in optometry. There were only 24 students and it was a difficult course to get into and difficult to stay in. While their daughter was aged 6-10, Dr. Hagen was going to school, as a married mother, and older than the others in her classes. That is a total of 20 years’ school to join the ranks of Doctor in the United States. Richard found employment in Tulsa, and they wanted to start out on their own. They found Sapulpa, and felt it was a good fit. They thought it was a little town with an identity of its own, not a bedroom community of Tulsa. Eye to Eye is open 9am 6pm on Monday Thursday, and 9am 4pm on Friday. Hagen wants to remind others that children up to the age of 21 are covered under Medicaid. She takes Medi. The Walmart stores might measure you for glasses, but not look at your health long term. You may have cancer, or cataracts, or the beginnings of a dozen other eye diseases, and finding them as early as possible can save your sight. Hagen pays her staff for full-time jobs and provides them with Health Care. Does Walmart do that? No, they de- pend on the U. S. government taxpayers to augment their pay with food stamps, and other forms of public dole.